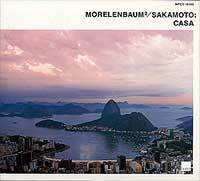 Paula Morelenbaum, once a vocalist in Antonio Carlos Jobim's "Nova Banda," wife of Nova Banda member, Jobim producer, and frequent Sakamoto collaborator Jaques Morelenbaum, and mother of recent Sakamoto collaborator Dora, has had an idea for a new project for about five years now. Recently the time was right for Paula to bring Jaques and Ryuichi into the new unit known as Morelenbaum2/Sakamoto. With the recording plans set, M2S first had an opportunity to take the stage together informally at the end of Sakamoto's European tour for an unannounced jam session in the lobby of London's Great Eastern Hotel. keys of his piano. During one of the recordings at his house a bird suddenly sang in the middle of the song. We all thought that was Tom." © 2010 KAB America Inc.